An often essential – yet sometimes feared strategy for small, local businesses is the creation of ‘local landing pages’. Or as I used to call them ‘area coverage pages’. Unlike brick-and-mortar premises pages (which Google recommend building for each location), local landing pages are designed to help businesses rank for towns and cities in which they don’t actually have a physical address for, but service and operate within. During June’s Ungagged London, I shared a session that briefly included Local Landing Pages and how I go about them. I wasn’t surprised during the Q&A and talking with delegates afterwards that there’s a taboo or fear of creating these types of pages. Done poorly, lazily or greedily, local landing pages can not only fail to rank, they can attract the attention of Google’s Doorway page algorithm. Google themselves shared valuable insight into Doorway Pages last year when they pushed an algorithm update for combatting them. In example above, you can see a local-intent search for ‘Blocked Drain Cambridge’. 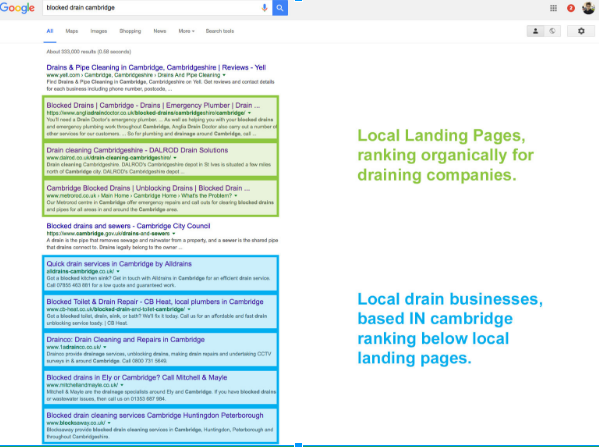 What’s surprising this often typical example, isn’t the local landing pages ranking highly, is how they outrank small local draining businesses who are actually based in Cambridge, England. Customers looking for a local service, want to find someone who is local. For me, local landing pages are an opportunity to assure and engage customers from surrounding areas that my client does indeed service their area. Well designed, engaging pages should qualify for inclusion within the main navigation and form an integral part of the user experience and conversion path. Above, this local plumber is based in Rugby, but has a service fleet covering the surrounding villages and towns. It’s also worth considering that Google’s Doorway Page algorithm is looking for isolated, hard-to-navigate-to pages. Linking and including the pages within the main navigation will indicate you’re not hiding them and connect with local customers questioning where the business operates. Work with your client to identify the 2-6 key areas that you wish to build your local rankings within. I too often see countless, repetitive area pages that have been deployed to rank for every city, town and village within a 50 mile radius. I advocate focussing your efforts on doing just a couple to begin with and doing them really well to test the opportunity. Try and start with a smaller less-competitive area so that you can gauge the competition and encourage your client to invest in additional pages once you’ve set the bar with your first few. Including a local photo on each page doesn’t just give you the opportunity to include unique content or accurately geo-tag an image, it allows you to engage and connect with your intended local audience. In the example above, I hired an affordable local freelancer photographer to capture my client’s branded vehicle at recognisable landmarks in each of their five local landing page areas. If you’re building local landing pages as part of a new website design, add these images to the shoot-list if a photographer is being hired for the website. It may sound obvious, but crafting unique, well written introductions and content is crucial for each of your local pages. Spend time with your client to understand their business and how their services may differ from area to area. If you’re struggling to write a short paragraph about your client and how (or why) they operate in that area, then you need to understand their business more or you’re trying to do too many pages! Consider asking how their services may differ, do response times change, is pricing different? Does the business have a history with the area, or contribute to the local community in any way? What expertise or tips can your client offer to people in that area to demonstrate their credibility and allow you to craft relevant, unique and engaging copy. One of the key types of content I like to prioritise for local landing pages is what I call ‘hyper-local’ reviews or case studies. A lot small businesses have fantastic content management systems like WordPress powering their websites. If reviews have been added to the CMS with adequate location-tagging it can be relatively straightforward to display a few reviews filtered to that location alone. If you’ve not yet established a review management process as part of your wider strategy, consider doing so for your local landing pages alone. If you don’t have a sufficient quantity of reviews, consider displaying case studies in a similar fashion. Not only will filtered reviews or case studies add unique content to your pages, you can also naturally reference the ‘hyper-local’ locations within that area such as villages, road names or postcodes. Alongside your copy (commandment 4), you also have the opportunity to differentiate each area by graphically distinguishing services, unique selling points or service level agreements. If your client has a call-out or response time, it’s likely to be different for each area so why not graphically display this key information alongside a map? Whilst the potential for what you can do here various from trade-to-trade, be creative. Whilst operating from a single location, this business has engineers specifically assigned to each area. In the example above, I learnt from my client that their gas engineers are actually assigned to set areas based on where they live. Again this is all content ‘breaking the template mould’ and allowing me to naturally integrate keywords without even trying. When local businesses are looking to be discovered, they aren’t automatically assigned the same levels of trust we naturally associate with bigger brands that we equally haven’t used before. Let’s not forget that these are LANDING pages we’re designing and it’s important to build that trust with accreditations, certifications, third party review widgets in order to engage and convince users. 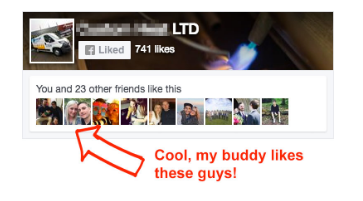 With my same example client, they’d naturally accrued over 700 likes on Facebook. By adding a Facebook Page Plugin into the design of the Local Landing Pages, I can leverage the popularity and hopefully allow a potential customer (logged into Facebook) to see their friend’s face who may already like the company! NAP Local Business Schema. This might sound crazy, but personally I avoid adding certain structured data on my local landing pages specifically. Because I don’t actually have premises address for the coverage areas, I don’t want to dilute the area-focus on the page by iterating the address and phone number appropriate to a different area. Using Fake Addresses. If you’re considering faking an address, buying a remote or PO Box address, don’t. Not only is it against Google’s policies, it’s just dishonest and isn’t presenting your client in the best possible light. Whilst it’s important to get the content of the page right, don’t forget (for a second time) we’re building a LANDING page. If your page is designed and structured correctly, this single page may present everything a potential customer needs to convert. This prominent, but easy-to-use call-to-action is completed three times more often that the contact page form. 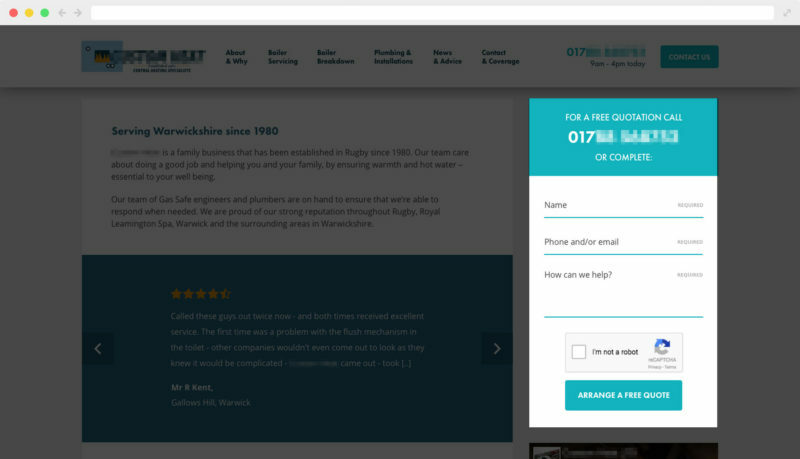 Not forgetting the core purpose of our page, to generate conversions, ensure that the page has adequate, clear calls to action such as a phone number, unique selling points and a mini enquiry form. 10 – Thou shalt not spam. And finally, it’s incredibly important to stop, look at your page and just simply make sure you’re not spamming. Whilst I can still see today local landing pages ranking that contain hidden text or blocks of areas or postcodes, these tactics dilute your efforts and will eventually fall foul of Google’s webspam initiatives. Pick and focus on just a single area, with one or two keywords and prove the concept before tweaking it or creating additional pages for new areas. With Paid Local Snack Packs imminent, Local Landing Pages are not just an SEO trick to build your client’s organic footprint. They’re also a credible paid-search landing page that you can use to direct local paid clicks. A Director at StrategiQ, James is an experienced designer and developer with a specialism in technical and local search for SMBs. Great post just finished reading it and have got some great ideas for my own personal blog. Thanks John, great to hear you found the article useful! James. Great example of a quality Local optimised landing page. One thing thats important for local businesses with a shopfront is, adding a Google Maps plug-in. This allowing for easy navigation for their customers and a Google Maps Boost. Thank you Leon. Are you adding the Google Map to show the coverage area for that specific client? My pleasure James. For this particular client, they have no shopfront. The purpose for this map on this site is, to postion them as local to their audience and help with onsite optimisation.